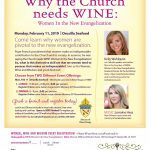 WINE: Women In the New Evangelization invites you to the 5th annual WINE: Catholic Women’s Conference. 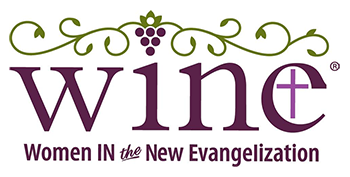 This year, WINE is excited to introduce an optional evening “Gathering in the Vineyard” on Friday, March 1, 2019. 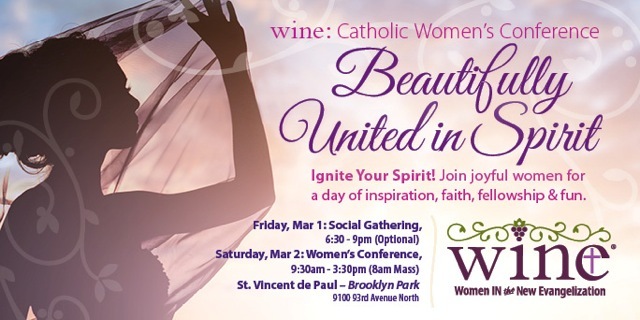 This social gathering is an opportunity for WINE leaders, enthusiasts or members, leaders of women’s ministries or apostolates, or anyone interested in leading others to Christ to come together with the WINE core teams from around the country and the conference speakers and be fed—physically, spiritually and emotionally! The evening includes a social hour, dinner, networking, and entertainment and is limited to 200 people. Saturday’s conference theme, “Beautifully United in Spirit,” is inspired by Ecclesiastes 3:11 and 1 Corinthians 6:17 and speaks to God’s providential plan for our lives and how He has beautifully united us in His Spirit for such a time as this to live out that plan. The conference, with emcee Alyssa Bormes, includes inspirational talks by Catholic singer and storyteller ValLimar Jansen; Catholic evangelist, author and retreat leader, Kathleen Beckman; St. Paul, MN’s own Bible teacher, author and singer, Elizabeth Kelly; and Catholic speaker, author, and founder of WINE, Kelly Wahlquist. The day will begin with Mass at 8:00 a.m. followed by praise & worship music led by Caroline Metzinger, inspirational talks, motivational entertainment, shopping, personal time to pray with prayer teams, confession, adoration, tons of laughter, a fabulous lunch, shopping, CHOCOLATE, door prizes, and a fun raffle! Deadline is Feb. 22, 2019, unless the event is sold out. A little inside scoop…all WINE events to date have sold out, so you may want to register now! We also encourage you to please pray about inviting a friend or three. You’ll be amazed at the power and impact of a prayerful invitation!